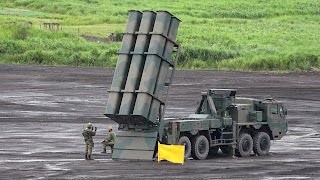 TOKYO, -- The Japanese Ministry of Defense (MoD) has outlined its plans to collaborate with local industry to develop new surface-to-ship missiles (SSMs) that will strengthen the sovereignty of its remote islands. An MoD spokesperson confirmed to IHS Markit on 19 August that the development project will feature a programme to develop Japan's existing SSM system, the Type 12, which is produced by Mitsubishi Heavy Industries. Additionally, the spokesperson said the MoD was in discussions with local governments about the deployment of the Type 12 to the islands of Miyako, Ishigaki, and Amami, which are all located in the disputed East China Sea. The Japanese Army Type 88 Surface-to-Ship Missile is a truck-mounted anti-ship missile system.